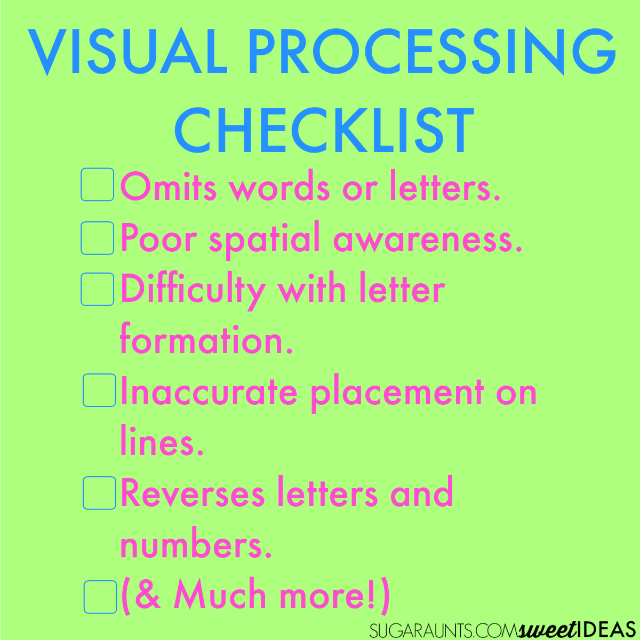 Visual Processing Skills are essential for handwriting. 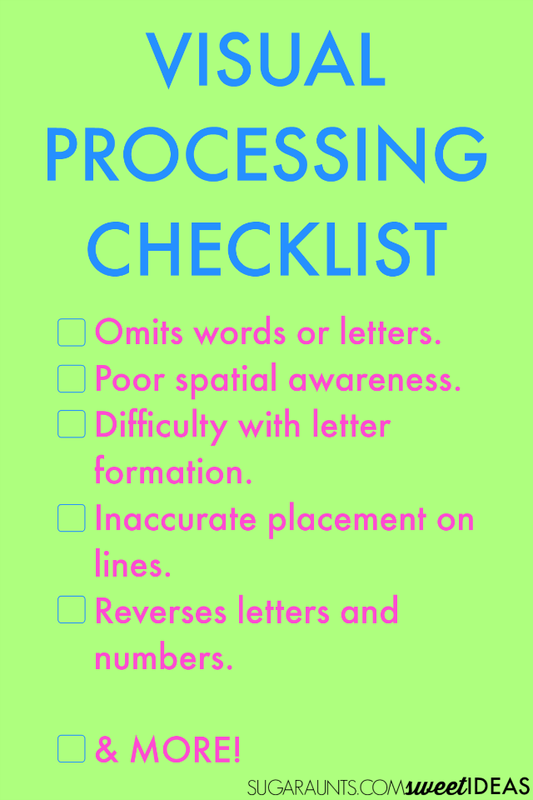 Use this Visual Processing Checklist in the classroom, home, or therapy clinic to help kids address visual processing skills for improved legibility in written work. When children learn to write, they copy and learn to form letters one at a time. They copy strait lines and combine them with different curves and angles to build letters accurately. After learning how to make letters, children start to place letters together to form two and three letter words. They are shown how to place the letters next to each other, (but not on top of one another or spread too far apart) to make a word. The words are placed on guidelines of writing paper. Typically, kids place letters above or below the lines and with various sizes with a degree of expected inaccuracies. As children gain more control on their pencil and master letter formation, they adjust line, size, and spacing on the page. Then, as children further gain in these areas, they write longer words and sentences with the ability to organize information on the paper. Margins, lists, copying information without omissions, and forming letters from memory all become skilled as children gain handwriting experience. But what happens when one or more of these skills suffer? What if written work does not progress as expected? The expectations of legibility and handwriting speed gain as a child grows and advances in grade. The ability to process the information that is seen translates to handwriting. Difficulties with reversals, copying skills, placement on lines may be a visual processing difficulty. A visual processing disorder refers to difficulty with response to visual information. This might be the way the brain perceives and responds to visual information or it might mean the motor output that occurs as a result of visual information. The information that is received is not processed correctly. Visual processing skills effect other areas of function but the scope of this post is addressing visual processing skills and handwriting. In general, visual processing difficulties result in a child having trouble with processing the information that they see. There are skills that are essential for handwriting that enable a person to write legibly. These visual processing skills are part of the "hidden vision" abilities that effect handwriting. Visual Responsiveness- Responding to sensory input is just part of visual processing. A child may overreact or under-react in response to visual information. Visual Memory-The ability to copy written work from memory as in copying homework lists from the chalkboard without shifiting vision with each letter. 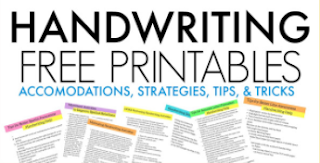 If you think your child or student might have some of these difficulties that lead to problems with handwriting, it can be quite beneficial to speak to an Occupational Therapist. 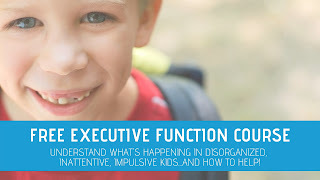 There are many different signs of visual processing disorder that can be spotted in the classroom or in the homeschool dining room that might signify a potential visual processing disorder. 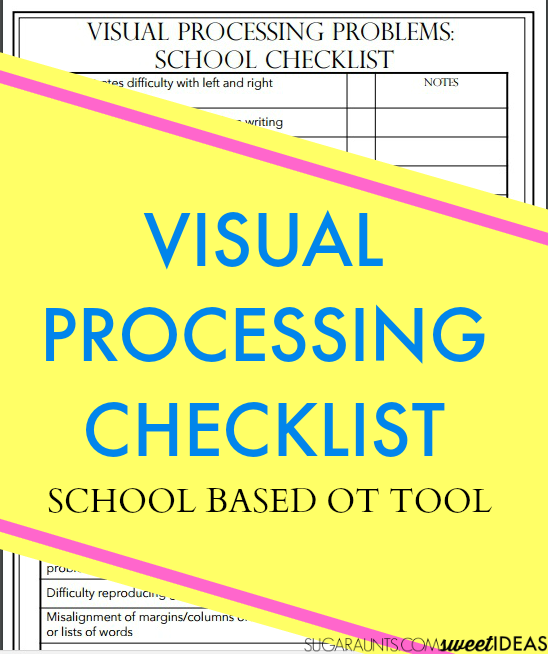 I have created a checklist that will help to guide the plan for students with visual processing difficulties presented in written work and classroom tasks. Grab your digital copy for $1.99 and print off this checklist to pass on to Occupational Therapists as part of a classroom screening, share with parents, or use when presenting information to physicians. 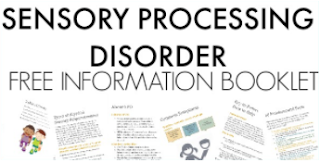 This checklist is not to be used as therapy or in diagnosis of visual processing disorders, but only as an informational tool. Get your copy and use it in the classroom, clinic, and home. 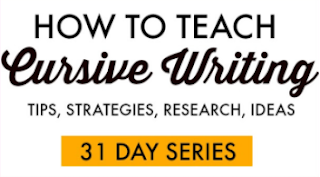 Maybe this one tool could be the informational gathering exercise that helps your child, student, or client to get on the right track to performing learning and written work. Sometimes, there are many problems with written work legibility that could be addressed with just a few simple quick fixes. Understanding processing skills might be what is needed to help kids attend, focus, learn, and write appropriately and legibly. 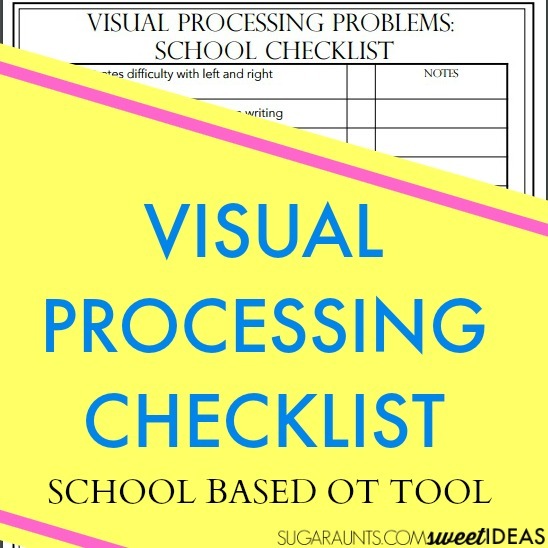 Grab your Visual Processing Checklist for the Classroom!